The Get Bear Smart Society (GBS), based in Whistler, British Columbia, Canada, champions progressive management policies that reduce both the number of human-bear conflicts and the number of bears destroyed. 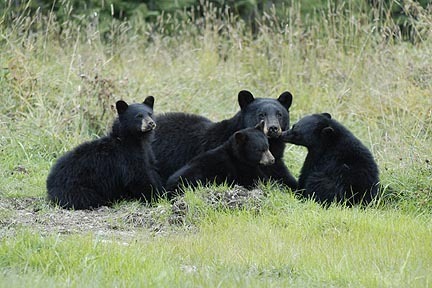 Our mission is to provide a safe environment in which people and bears can coexist in harmony. We accomplish this by implementing effective waste management systems; educating people on dealing with bears in their communities as well as minimizing backyard attractants; and promoting innovative bear management practices. Overall, we are creating a paradigm shift in people's attitudes toward bears and other wildlife by replacing fear and ignorance with understanding and respect. 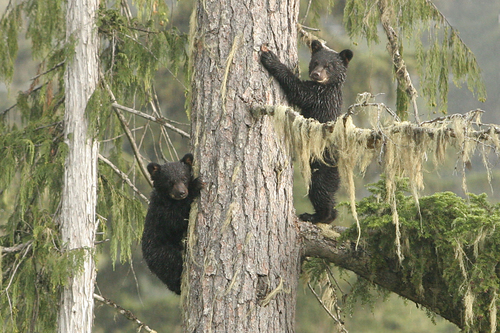 As a result of GBS programs, the number of so-called 'problem' bears destroyed in Whistler has been reduced by 70%. Our persistent hard work and dedication have also resulted in Whistler becoming a leader in establishing a 'Bear Smart' community, providing a model for other communities to follow. But the work of the Get Bear Smart Society is not limited only to Whistler: the Society is affecting bear management policies across British Columbia and Canada - and even throughout North America. GBS is perhaps best known for its innovative and proactive non-lethal bear management training program, leading the way in developing and continually improving standards and curriculum, as well as providing training to various police and wildlife agencies. The non-lethal program is the highlight of our ongoing search for the best bear management practices, providing officers with a much needed alternative to destroying bears. In fact, the results of Whistler's pilot program and research are forming the basis for change in sustainable bear management policy province wide and even nationally. We also spend a great deal of time working to bear-proof the waste management system in Whistler. While it might seem like an easy task, bears continue to outsmart us by learning how to penetrate weak systems. We are currently experimenting with various waste containers to determine the most bear-proof and people-friendly model. Since Whistler does not have curb-side pick-up, but rather two main compactor sites, we are working with our Municipal Council and staff to implement a waste management system that is convenient and easy to use for all residents. We have also developed guidelines for building bear-proof enclosures for businesses and multi-unit residential complexes. As a result of these efforts, we will be able to make sound recommendations to other communities struggling to bear-proof their waste systems. GBS works hard to educate the public, residents, homeowners, children, businesses, all levels of government, enforcement agencies, parks, and NGO's to better understand bears. At the heart of our education is our program to educate residents on reducing backyard bear attractants. Our educational programs include the production and distribution of educational materials ranging from childrens' programs to resident information to professional training resources; public and corporate bear smart presentations; an extensive ad campaign; newspaper columns; a comprehensive website; and interpretive signage. Our Neighbourhood Bear Watch program includes a bear information hotline; residential and business bear hazard assessments; and targeted door-to-door canvassing. We have also created a line of educational merchandise including stickers, games, and logo wear - combining learning with fundraising. Using Whistler as a model, GBS assists with the implementation of bear smart programs throughout BC, Canada and the United States through research, training, consultation and education. The key to managing human-bear conflict involves minimizing bear attractants, reinstilling bears natural wariness of humans and looking at innovated ways of keeping bears out of urban areas. We work with the public, NGO's, government bodies and law enforcement agencies to provide the best current information on managing human-bear interactions. GBS is committed to exploring and implementing non-lethal approaches to bear management. We recognize the importance of directly addressing the root cause of human-bear conflicts. While we do not have all the answers, we will continue to explore new ideas. We will test and monitor their effectiveness in an ethically and morally responsible manner, minimizing negative impact on wildlife and the environment. GBS is committed to thinking outside the box. We continuously evaluate current methods, determine their effectiveness and explore new, improved methods. For example, we are revising our current educational campaign to include community-based social marketing tools. Recently, we became aware that information-based education is not enough. Through surveys, we've learned that while people may be aware of how to be bear smart, this is not reflected in their behaviour. In order to achieve sustainable behaviour change among community members, new techniques are required. Community-based social marketing tools show great hope. We plan to complete the necessary research, through focus groups and surveys, in order to help us implement the appropriate community-based social marketing tools. GBS ensures broad community participation and collaboration by involving stakeholders at all levels (from individual community members to local businesses, to municipal and provincial governments and First Nations) in a collaborative process throughout the planning, management and implementation phases of our programs. GBS also provides information and consultation to various groups, both government and NGOâ��s (non-government organizations) throughout the province. Public support of our program has been overwhelming. Our team brings a wealth of knowledge of bears and wildlife: we are leading experts on living with bears in residential communities and managing bears in a non-lethal manner. President: Ainslie Willock; Vice President: Wayne McCrory; Executive Director & Secretary/ Treasurer: Sylvia Dolson; Directors at Large: Crystal McMillan, Dan LeGrandeur (also our Training Instructor), Dr. John Beecham; Professional/Scientific Advisors: Dr. Lynn Rogers, Ben Kilham, Carrie Hunt and Evelyn Kirkaldy. Whistler Bear Working Group; Resort Municipality of Whistler; BC RCMP; BC Ministry of Environment (Wildlife & Enforcement Depts. ); Bear Aware Program of BCCF; North Shore Black Bear Network (NSBBN); Pacific Rim Bear Smart Society; Canadians for Bears; International Bear Association (IBA); Humane Society of the United States (HSUS); World Society for the Protection of Animals (WSPA); BC Rehabbers Association; Y2Y, Bear Folks, Animals Canada listserves contributor. The Get Bear Smart Society, formed in 1995, is registered as a charity for income tax purposes with the Government of Canada: 87720 6565 RR0001; and incorporated in the province of British Columbia (S-36282). 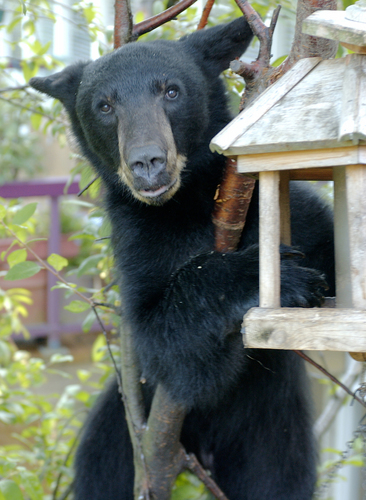 Don't attract bears to your property with birdfeeders, fruit, gardens, compost heaps, dirty bbq's or pet food. Put your garbage and recylcling in bear-proof dumpsters or place curbside only on the morning of pick-up. Don't stock pile it. Keep accessible doors and window closed and locked. Use deterrents to discourage bears from entering your property. If you encounter a bear in an urban area - make lots of noise to encourage it to leave. Keep an eye on your neighbours - make sure they are following bear smart practices. Stay alert and aware. Obey all trail closures and information signs. Avoid bears - make noise, watch for bear sign. Don't approach or crowd bears. Don't try to pet bears! Be prepared - do your homework. Know how to react to an encounter or attack. If you encounter a bear: remain calm, talk in a calm voice, back away slowly. Don't feed bears. That means not leaving food scraps behind too. Carry bear spray as a first line of defence. When hiking, pack it in, pack it out - keep food in bear-resistant containers. 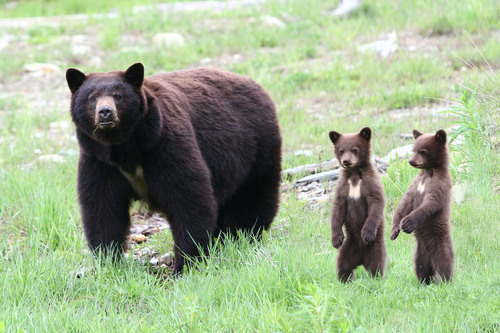 Hike during the day in groups in grizzly country, keep children nearby and dogs on a leash. 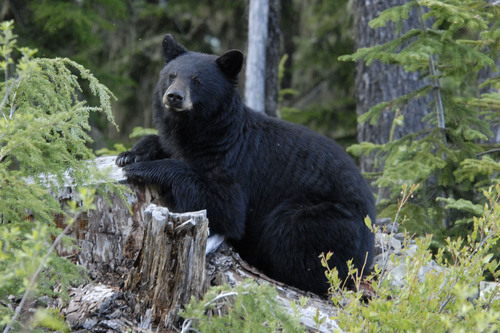 When camping, dispose of garbage in a bear-proof container or hang it out of bear's reach. Cook away from your campsite, clean up immediately and dispose of dish water 100 m from tent. Camp away from travel corridors, bear sign and bear feeding sites. Use a portable electric fence around your tent in grizzly country or in remote areas of bear country.